These are really great observations, Brendan. This is kind of fantastic – Its probably the first time I’ve considered using typed notes instead of my handwritten ones. Though I suppose I could bold or underline them instead. An actual physical highlighter pen would probably work well with handwritten notes, too. I have lots of respect for those with the discipline to use handwritten notes, especially in something like a composition book. If I did so, I think I would be constantly afraid about running out of space for expanding various aspects. I tend to also write nonlinearly (how I have been spoiled by software text editors). Have you seen the pages from my Numenhalla or Perdition notebook? I guess what I would say, is that being forced to think or plan before writing has never served me poorly. Have you posted the contents of any of your notebooks? Great posts! This adventure publisher is paying close attention. How funny, I just wrote on exactly this same topic last week, and it turns out that you and I end up in very similar places in terms of our philosophy of dungeon key formats. Great article and ideas. 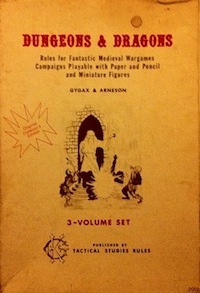 Highlighting things that must be brought to the attention of players immediately is essential, otherwise the exploration style D&D process breaks down. But equally important is the style or tone of the location that the PCs are exploring. It is the balance of these two that is tricky to replicate from 3rd party material. Pieces written by the DM himself/herself will be much simpler as the DM will have the image in mind of the immediate area and can relay it easily. I am using a slightly different method, print the map out of a 3rd party adventure, making sure there is some white space around it and then use shorthand style symbols and a few handwritten notes to highlight what the players need to know. I also try to distill the tone of the location into a few descriptive words so that I can drop those in or emphasise them occasionally. This means when it comes to the session I have but a single sheet of paper in hand. That sounds like a pretty reasonable approach. Though I often enjoy arbitrary restrictions, I don’t think that there is any need to use a single sheet of paper as a limit. I don’t mind context switching, as long as it is not continuous. An annotated map can be very useful. In an ideal case, unannotated maps would be included in any products as well, for use in restocking. I found myself recently redrawing module maps so that I could have a version to reveal slowly to players that did not have room numbers or hidden features such as secret doors. Mood is worth mentioning, though I think the need of extensive prose to communicate it is often overstated. A few well-chosen adjectives go a long way, as does actually interesting content. For example, “clay golem with wicker-fetish head imprinted with the names of 2000 slain soldiers.” Content often is tone. Just give the players notes describing the room and tell them about any creatures which would be the primary concern initially. You can even include a little picture of the odd shaped rooms you have to draw anyways for the mapper. If you use pictures or downloads you could include that sort of thing as well. 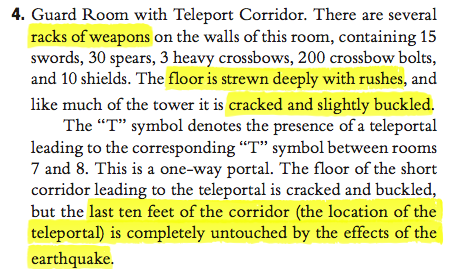 In the age of the copy/paste every adventure can have as many handouts as Tomb of Horrors. Heck, you create bunch of gifs and text or email them one at a time. It seems like you’re addressing a slightly different issue. Even before one might consider something like handouts, the referee needs to know everything immediately important about an area (what constitute trap triggers, clues, etc). Most of the blocked text could be included in a handout and the players could read it or not without breaking the flow of the game or changing the tone. Personally I like bullet points for the GM. Just the facts and let the DM fill it out, but if you want the detail (or in the case of really complicated shaped rooms) the handouts are easy enough and all of the lose of concentration problems seem to disappear.